Callum Ilott and Lando Norris are the winners of two Sunday’s races of the seventh round of the FIA Formula 3 European Championship at Circuit Park Zandvoort. After winning Saturday’s race from pole positiom, Lando Norris was the fastest qualifier both for Race 2 and Race 3. However, he was penalized for the Race 2 because he failed to slow down sufficiently for yellow flags. He was moved for two places on the grid, promoting Callum Ilott to the pole position for the Race 2. The 18-year-old driver of Prema Powerteam’s #53 Dallara-Mercedes converted pole position into his fourth win of the season. Three more British drivers finished the race in the top four positions – Jake Hughes (Hitech Grand Prix) was second, Lando Norris (Carlin) third and Harrison Newey (Van Amersfoort Racing) fourth. David Beckmann (Motopark) finished fifth, meaning that five different teams were classified in the first five positions. Third-place finish in the second race moved Lando Norris to the championship lead ahead of Maximilian Günther (Prema Powerteam), who finished seventh in the Race 2. 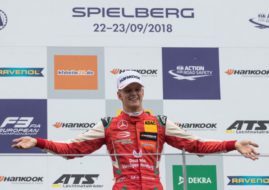 By winning the third race of the weekend, Norris increased a gap ahead of Günther, who finished third in the second race. The gap is now eleven points. Ferdinand Habsburg finished second in the third race, making it the double triumph for Carlin. Other point scorers in the final race of the weekend were Guanyu Zhou, Jake Hughes, Pedro Piquet, Harrison Newey, Ralf Aron, Joey Mawson and Nikita Mazepin. The next championship round is scheduled for September 9-10 at Nürburgring.